It used to be that home automation meant something as simple as a garage door opener or setting a timer on your lights. But technology has come a long way and we can now have “smart homes” that are interconnected, can be controlled from far away and that create efficiencies that save you time, money and energy. If you’re thinking of home automation, here are some things to consider. Home automation is generally considered anything that controls, monitors or automates things in your home. If it includes some kind of artificial intelligence, connects to the internet, and both “learns” your likes and habits while also letting you control it remotely using your phone, tablet or computer, it’s “smart”. And a smart home is one that has enough of these devices to form a full network. Smart home technology has been growing rapidly — it’s expected to be a $130 billion industry by 2020, according to Real Estate Tech News. But it’s also one of those areas that can be exciting to think about, yet confusing to understand. This is the first question to ask yourself. What do you want this technology to do for you? Maybe you’re looking for the convenience of a Wi-Fi-connected system that you can control from your cell phone. Perhaps your priority is the peace of mind that comes from a reliable security system. Maybe you’re after a home that keeps the temperature and humidity comfortable without you having to think about it. Or perhaps you simply want a home theatre. Once you’ve determined what it is you want — and often, getting the advice and guidance of a pro is the best way to help figure this out — then you can consider the various options, such as whether you can go the off-the-shelf DIY route and install yourself or whether you need a professional installation. Does it need a reno? If all you want is a smart thermostat, you obviously don’t need to renovate. But if you’re looking at, say, a state-of-the-art home theatre, that’s a different story. You’ll want to consider adding sound-proofing, for instance, adding speakers in the walls and ceiling, and maximizing the space for it’s intended use. Use a professional: Make sure whoever you get to assist you has the credentials and experience for home automation and audio/visual. You may also need to bring in an electrician separately. Think ahead: Think about putting conduits in the walls for future renovations or potential added A/V or automation. This minimizes the need to rip up drywall later because wires can simply be fished through the conduit. Also, technology changes so quickly that you need to think about potential changes or upgrades you might need in the next few years. What’s your budget? How far do you want to go? The more expensive the system, the more flexibility you’ll have in how you can control it. Is spending $1,000 on an off-the-shelf control system, remote and speakers from Best Buy enough or is what you want more along the lines of a system you control through your phone, computer, and multiple places in your home? These can run you several thousand dollars and take time to install. To connect or not: Wi-Fi-connected systems get better and faster every few years and a huge benefit is that you can control them from anywhere. But that’s also a down side: it can be difficult to disconnect while you’re away. Plus, a Wi-Fi system will claim some of the bandwidth available to your other devices and may require upgrading your internet package. A hard-wired system, on the other hand, doesn’t rely on the internet, but then you can’t control it far away. Which is more important to you? It’s prime vacation season. If you’re away and have a home that’s automated, there’s great peace of mind that can come with that. You can keep an eye on your home from the cottage, program lights to go on and off, have it automatically alert both you and authorities if there’s an intruder or other problem that crops up, or simply confirm that you did remember to turn off the coffee maker before you left. 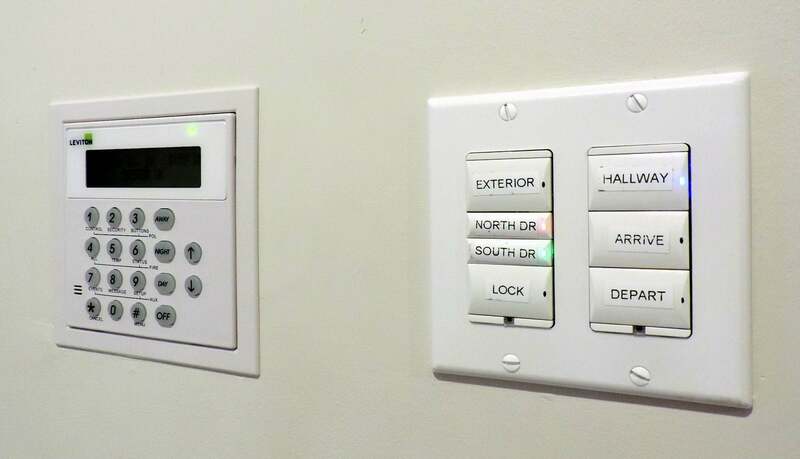 If you’re considering home automation upgrades to your home and aren’t sure where to start, give us a call!